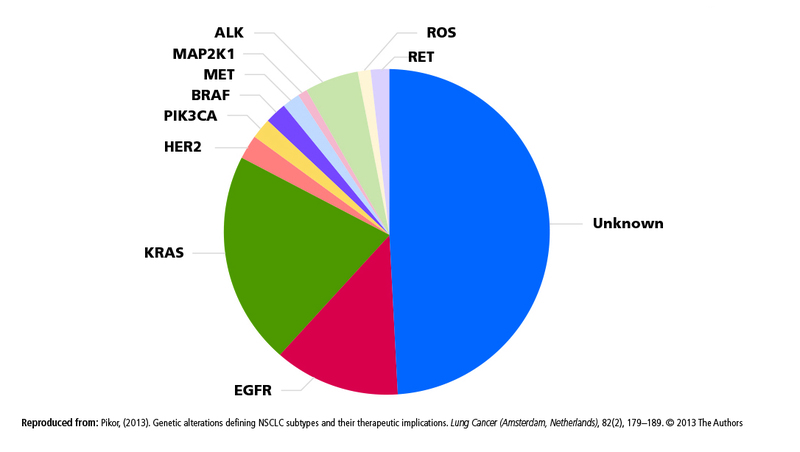 The objective of cancer research is to generate new knowledge that can be used to improve survival and quality of life for patients with cancer. Clinical trials are the key step in advancing potential new cancer treatments from the research setting to the cancer care clinic, and patient participation in trials is crucial to this success. Most patients express a willingness to participate in clinical research, yet only a small fraction ultimately end up enrolling in a cancer clinical trial due to barriers that make participation difficult or even impossible. 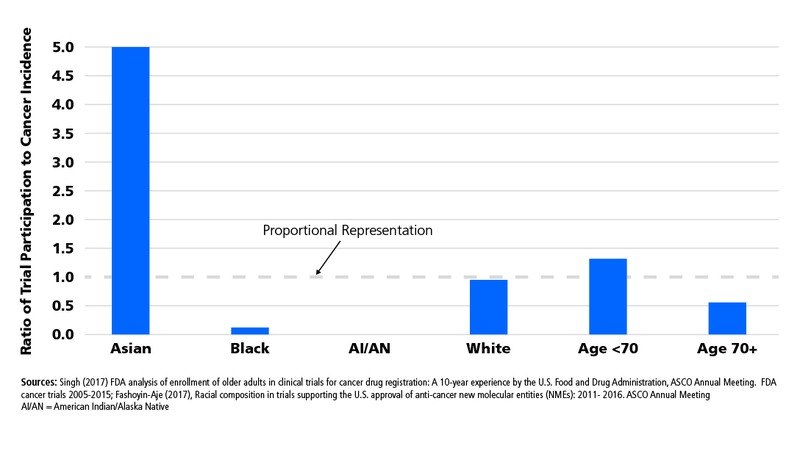 Consequently, approximately 20% of cancer clinical trials fail due to insufficient patient enrollment. Understanding and addressing these barriers is critical to accelerating progress in cancer research. 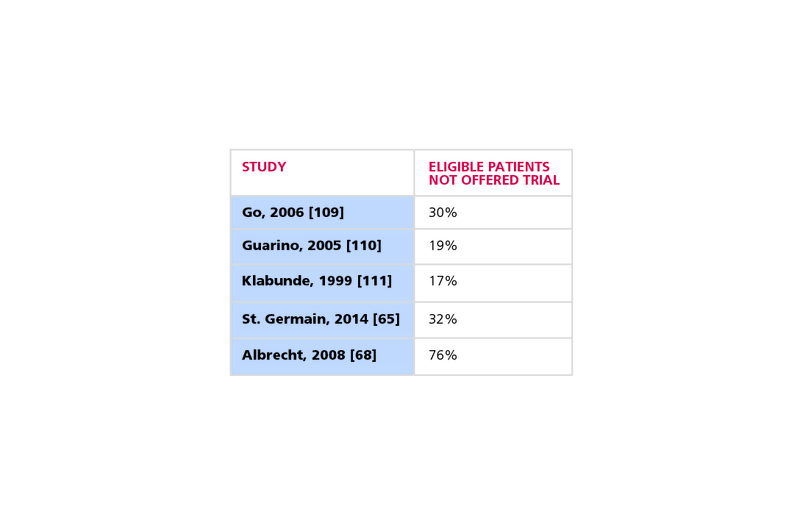 The numerous barriers that keep patients from enrolling in clinical trials have been well researched but often addressed in isolation from other barriers. The landscape report attempts to bring all the relevant evidence together in one place, synthesizing the relationships of barriers to each other and scaling each barrier’s contribution to the problem as a whole. This report is meant to serve as a resource to inform discussions and actions aimed at addressing the barriers preventing patient participation in cancer clinical trials. Based on the research contained in the landscape report, a set of 23 consensus recommendations were developed for reducing the barriers identified in the landscape report. The recommendations are grouped by category, and require both programmatic activities and policy changes to be realized. The summary recommendations are listed below. For additional context and details, please refer to our downloadable recommendations. Build and maintain a pool of diverse, research-trained staff which includes dedicated research positions as well as providers with multiple roles, with special attention to developing workforce reflective of underrepresented populations. Maintain or increase funding from all trial sponsors, including NCI, for dedicated site research staff who can open trials and recruit patients, so that trial conduct is scalable and sustainable. 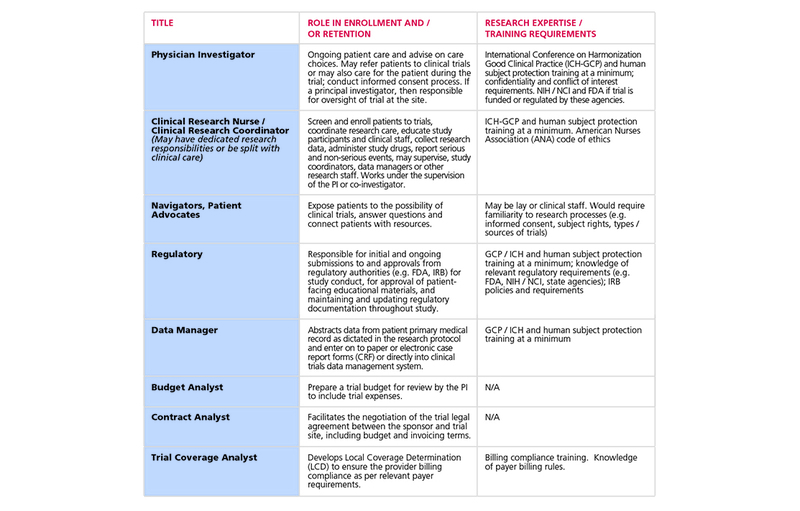 Provide dual-role staff—clinical staff providing patient care along with fulfilling research roles—with appropriate incentives to promote their participation in clinical research activities. Institutions should create protected time, a range of incentives, additional resources, and recognition for dual-role staff to conduct clinical research. Fully utilize nonmonetary incentives like quality or accreditation metrics to drive clinical research activity. Sites should manage trial portfolios so that they match patient characteristics in the community that is served by a practice’s catchment area. 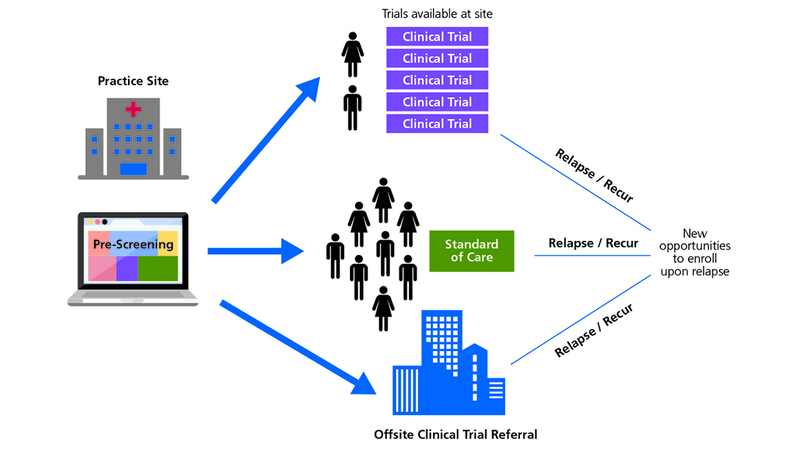 Stakeholders should collaborate to develop free or affordable technology, tools and processes targeted toward non-research sites/providers that make matching patients to trial opportunities and referral of patients interested in trial participation easier. 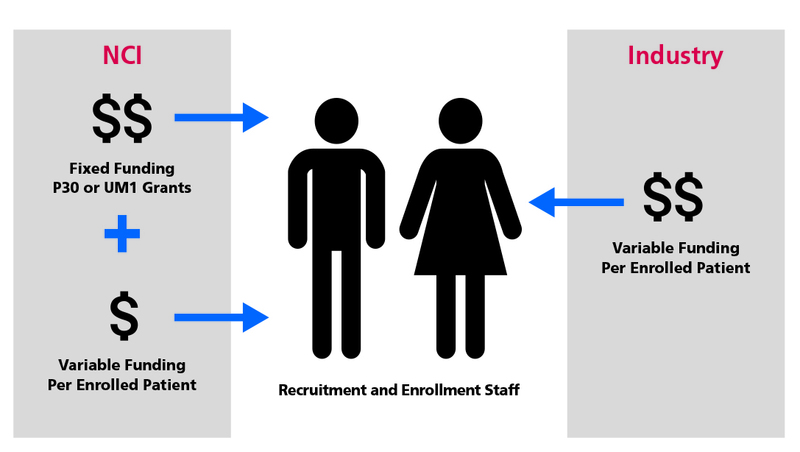 In order to achieve robust accrual, sites should employ protocols or technology to make prescreening incoming patients for trial eligibility more scalable and systematic. Ensure that matching tools are easily available to providers in their workflow. Standardize eligibility criteria so that it is machine-searchable. Standardize clinical trial protocols into formats easily incorporated into EMRs. Create and implement ways to streamline the process and reduce effort needed to open clinical trials. Expand use of standardized contracting for clinical trial conduct (e.g. Accelerated Clinical Trial Agreement, TransCelerate, Society for Clinical Research Sites, etc.). Continue to develop operational and contracting models for research enabled sites to participate in clinical trials just-in-time, where clinical trials are opened where applicable patients are identified. Expand and encourage use of Central IRBs for multi-site trials. Smaller practice sites should consider participation in research networks as a way to gain access to shared research infrastructure and clinical trials. 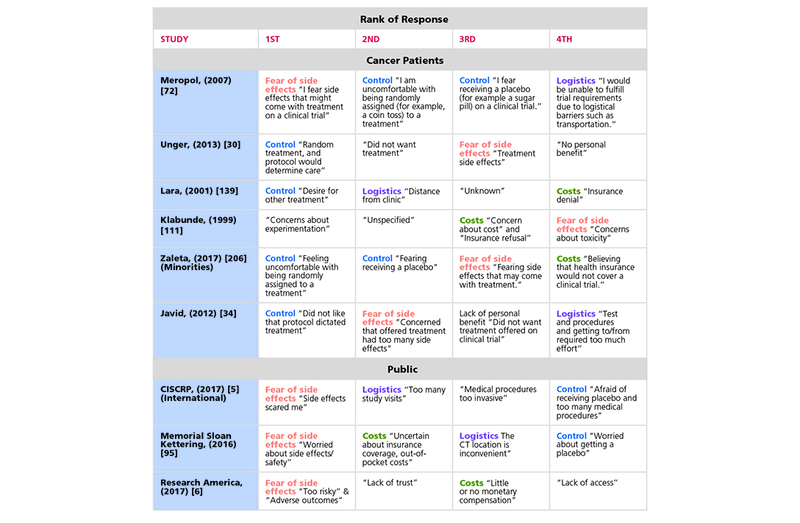 Present cancer patients with specifically identified trial options as part of the physician-patient treatment decision discussion using evidence based methods. 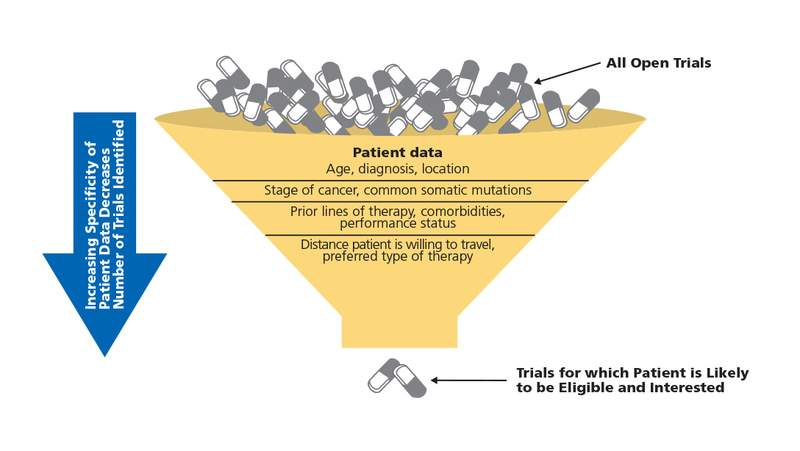 Promote general awareness among cancer patients and their families of clinical trial participation as a viable treatment option early during the course of patient care. Non-site specific trial matching and navigation services should be available for patients not provided trial options by their provider or institution. These services should clearly communicate roles and objectives. These methods, materials, and resources should be collected, evaluated and made available to the community. Research programs should provide these resources and services to patients, families and caregivers. Improve informed consent documents and processes to ensure education and comprehension by patients of the research in which they are contemplating participation. Provide cost transparency by providing full coverage analyses on all trials to clearly articulate responsibility for all anticipated trial costs. Trial sponsors should collaborate with institutions to clearly define sponsor obligations with respect to covering supplies and services related to trials. Sites should provide patients considering enrolling in trials with information that enables the patients to consider how their direct and indirect costs would differ if they enrolled in the trial or received care outside the trial. Ensure coverage of routine patient care costs incurred in cancer clinical trials by all payers. Further the implementation of existing federal requirements for private insurers to cover cancer clinical trial routine patient care costs in order to provide timely enrollment and avoid administrative burdens to enrolling patients on clinical trials. Bolster state requirements to cover routine patient care costs in cancer trials. Require state and federal insurance authorities to enforce routine patient care requirements. Ensure Medicaid coverage in all states and territories of routine patient care costs in cancer clinical trials. Shield patients from out-of-pocket ancillary costs of trial participation such as travel, parking, and housing. Clarify policies to ensure reimbursement of ancillary costs is not seen as undue influence and ensure awareness of allowable reimbursements. Fully utilize existing support resources (e.g. ACS Hope Lodge, Road to Recovery, Lazarex Foundation, non-emergency medical transport), and develop new resources that shield or offset ancillary costs associated with trial participation. Design trials to be more patient-centric by using patient input during the design and implementation phases. Trial sponsors and research programs should explore the use of technology or other tools to reduce patient time and travel burdens associated with clinical trial participation. Modernize eligibility/inclusion/exclusion criteria to achieve the most relevant parameters that will ensure scientific integrity without unnecessarily excluding patients. Ensure eligibility criteria do not preferentially exclude a racial or demographic group, e.g. upper age limits, or excluding comorbidities more highly associated with demographic or socioeconomic subgroup unless specific rationale for exclusion exists. Encourage broad-panel biomarker testing programs to help promote simultaneous pre-screening for multiple targeted therapy trials. Develop and share resources that can be used for detailed assessment of accrual feasibility during the design phase of trials. These include patient and trial databases and modeling software. Ensure that research sites selected for multi-site trials have diverse patient populations that reflect the broader population with cancer. Provide clinical trial navigation services for patients from medically underserved groups to connect with publicly available support resources and culturally sensitive education materials. Seek engagement and partnerships with community leaders and community-based organizations–especially those serving racial and ethnic minority groups as well as medically underserved communities–to effectively disseminate information about the importance of clinical research participation as a social justice issue.